The policy guidelines for the committee include keeping Florida a low-tax environment for individuals and businesses; providing a predictable and reasonable regulatory environment; providing a reliable and advanced hard and soft infrastructure; building a well-trained and highly skilled workforce; and fostering a responsive, efficient and accountable government. This follow on article reported who was selected by Governor-elect DeSantis to serve on the economic committee. They include Developer/Lightning owner Jeff Vinik, Tampa Bay Bucs COO Brian Ford, Tampa International Airport CEO Joe Lopano, TECO VP Chuck Hinson, former CEO of SunTrust Tom Kuntz, AT&T Florida President Joe York. What do they all have in common? 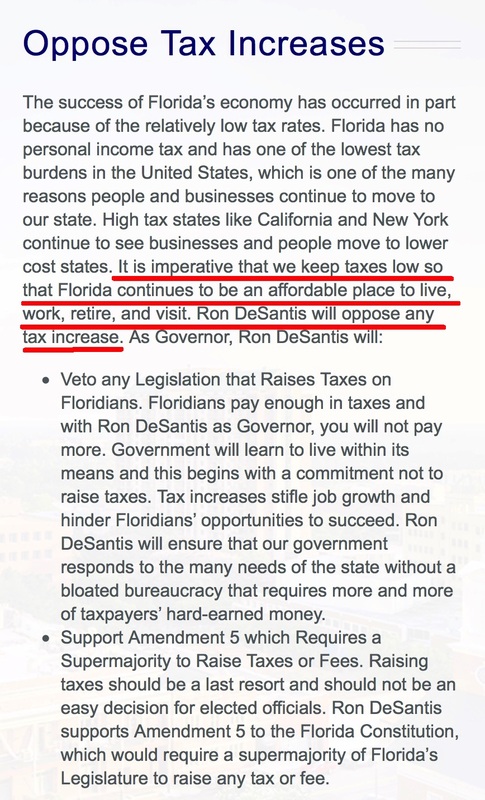 They and/or their firms are all connected to tax hikes and HIGHER taxes in the Tampa Bay area. As we reported here, Tampa International Airport CEO Joe Lopano wants his 1.3 mile People Mover that cost almost a half BILLION dollars (about $350 MILLION per mile) to be extended to the proposed Westshore multi-modal center. One of Lopano's VP's, Janet Scherberger, was an activist for the tax hike. She and Aviation Authority Chair Robert Watkins were directly connected to the All for Transportation PAC. Vinik, TECO, the Bucs, SunTrust & AT&T are members of the Tampa Bay Partnership. The Tampa Bay Partnership is the leader of the local rail cartel who has supported every transit/rail tax hike boondoggle in Tampa Bay. Vinik handed his All for Transportation PAC about a million dollars to get the 30 year $16 BILLION rail tax hike on the ballot and passed. He was the biggest donor to a $4 million deceptive marketing campaign used to get the massive unnecessary tax passed. The Partnership donated $250K, the Bucs donated $100K, TECO donated $50K and Gray Robinson donated $15K to the All for Transportation pro rail tax hike campaign. In 2010, the Tampa Bay Partnership was the symbiotic twin of the pro rail tax hike Moving Hillsborough Forward PAC. The Partnership funded and led the $1.6 million Moving Hillsborough Florida pro rail tax hike campaign with SunTrust providing the $50K anchor donation. TECO donated $40K, the Bucs donated $50K and Gray Robinson donated $5K to tax hike Moving Hillsborough Forward campaign. In 2014, Tampa Bay Partnership provided the administrative support and helped lead and fund the Greenlight Pinellas $1.2 million pro rail tax hike campaign. The Partnership donated almost $100K of in kind and cash donations, TECO donated $20K, the Bucs donated $25K and SunTrust donated $15K to the Greenlight tax hike campaign. Jeff Vinik and his Tampa Bay Partnership allies cronies are responsible for funding the tax hike effort for Hillsborough County to have the highest sales tax rate in the state of 8.5%. Hillsborough County will now have the same sales tax rate as San Francisco, CA. 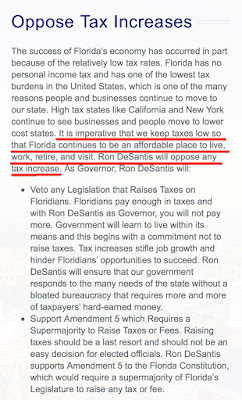 How did the tax hikers get selected to advise DeSantis's on how to keep Florida a "low tax environment for individuals and businesses"? Jeff Vinik and the Tampa Bay Partnership are the rail tax hike kingpins in Tampa Bay. The Tampa Bay Partnership falsely claims they represent the business community of Tampa Bay. They do not. No one elected or appointed the Tampa Bay Partnership to represent anyone. The Tampa Bay Partnership is a pay to play special interests lobbying organization who consistently advocates for higher taxes and bigger government. The Partnership members are elitists who want power and control. They lobby for regionalism and bigger government so they will have even more influence. It was the Partnership who forced TBARTA on Tampa Bay, now the regional transit agency controlled by them that taxpayers are forced to pay for. The Tampa Bay Partnership is the "Swamp" in Tampa Bay. None of the Partnership tax hike swamp should be anywhere near an economic committee whose goal is to keep "taxes low" in Florida. Who vetted these committee members? Was it DeSantis? Was it Weatherford or someone else? Is DeSantis unaware? Does he not know who these people actually are? Does DeSantis not know these special interests elites are the biggest advocates for tax hikes in Tampa Bay? The Swamp already has access and influence. Their voices always get heard. Florida's population is about 21 million. There are plenty of well qualified people to choose from to help provide economic policy guidance to Governor-elect DeSantis. DeSantis should not empower the Swamp creatures who consistently fund tax hike initiatives in Florida. He should not reward the tax hike crony capitalists with cushy policy advising positions, especially for a committee advising how to keep taxes low in Florida. He [DeSantis] announced on “FOX and Friends” Friday morning he’s running to be Florida’s next governor. “I’m in a position to exercise the leadership that can build on the great work that Gov. Rick Scott has done to advance economic opportunity, reform education and drain the swamp in Tallahassee, which needs to be drained just like Washington,” DeSantis said on the program. In a mailing to Republican voters in Florida, U.S. Rep. Ron DeSantis calls the support of President Donald J. Trump "a badge of honor." DeSantis tells voters he needs money to fight the "Clinton/Crist/Soros Democrat machine" and that he'll "drain the swamp in Tallahassee." You cannot drain the Swamp in Tallahassee if you are swimming with them. Original source for tax hike campaign donors was SOE campaign filing reports. Donor list for the All for Transportation, Greenlight Pinellas and Moving Hillsborough Forward tax hike campaigns can be found here. The swamp network doesn't reach the grass roots conservative base. It's unclear whether or not Desantis is aware, however, his team should be. If it wasn't for the steadfast conservative base, Desantis would not be Governor. Powerbrokers like Vinik always want to care for the special interests while keeping the average taxpayer bearing the brunt of the cost for their pet projects. Desantis needs to reconsider these choices and put at least a few grass roots leaders in key positions!! !